"Mechanical exfoliation technologies like Microdermabrasion tend to offer faster results than chemical methods, because it takes time for the acids to sink in the results and start the exfoliation process. Chemical treatments also usually require more downtime, and they can be particularly harsh on the skin." Exfoliation is an absolutely essential step in everyone’s beauty routines because it improves the overall health of the skin, and increases skin’s radiance. There are two primary methods to exfoliate the skin: mechanical and chemical. Each route aims to remove dead skin cells from the surface of the skin, which will in turn improve skin tone and texture. Mechanical exfoliation achieves this goal by incorporating some sort of scrubbing or scraping mechanism to rejuvenate the skin while chemical exfoliation utilizes acids to bring about similar results. Mechanical exfoliation technologies tend to offer faster results than chemical methods, because it takes time for the acids to sink in the results and start the exfoliation process. Chemical treatments also usually require more downtime, and they can be particularly harsh on the skin. Microdermabrasion is one example of an effective method of mechanical exfoliation. This cosmetic treatment utilizes a minimally abrasive wand to gently exfoliate the skin. Earlier generations of microdermabrasion system incorporated a crystal tip applicator to sand the skin, but newer models have replaced the crystal materials with diamonds. Patients tend to find crystal systems more irritating to the skin than their diamond counterparts. 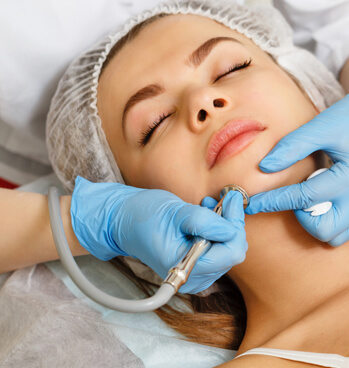 The Metropolitan Vein and Aesthetic Center uses a laser-cut diamond tip applicator, in combination with a vacuum-like apparatus, to gently exfoliate the skin and stimulate collagen production. We have provided a list of frequently asked questions below to help you get acquainted with the microdermabrasion system. Who is Microdermabrasion good for? Can I get this treatment during lunch? Yes! Treatments time can vary depending on skin concerns, but a facial generally lasts between 10 and 15 minutes. Patients may experience a red or pinkish appearance to the skin immediately following treatment, but the condition typically fades within a day. Additionally, a single microdermabrasion treatment by Metropolitan Vein and Aesthetic Center will produce subtle changes to the skin, but continued treatments can help achieve longer term beauty goals. Results can also be maintained through touch-up treatments spaced every two or three months.